39 1/2 by 20 by 17 in. 100.3 by 50.8 by 43.2 cm. 22 7/8 by 16 1/2 by 18 1/2 in. 58 by 42 by 47 cm. 10 1/4 by 8 1/4 in. 26 by 21 cm. Height: 36 3/4 in. 93.3 cm. Height: 29 1/2 in. 74.9 cm. 25 3/4 by 13 3/4 by 11 1/4 in. 65.4 by 35 by 28.5 cm. 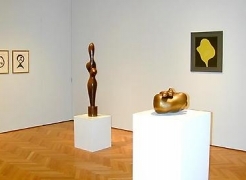 A pioneer of abstract art, Jean (Hans) Arp was on the forefront of artistic practice throughout his career. He worked within surrealism and constructivism before becoming a founder of the Dada movement. Best known for his biomorphic sculptures made from plaster, stone, and bronze, Arp turned away from convention and went in search of new forms by looking for inspiration in the purely natural world: plants, seeds, the sky, animals and the human body. He was enthusiastic to incorporate discarded papers and fabrics into his work, adding layers to his geometrical organic forms. He is known to have been extremely influential on later 20th century abstract artists including Joan Miró and Alexander Calder. 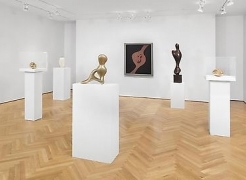 As a sculptor, painter, and poet he was active in several diverse art groups including Der Blaue Reiter, with Wassily Kandinsky and Franz Marc, and the Cabaret Voltaire. Jean Arp was born in Strasbourg in 1886. Arp studied at the Kunstschule, Weimar, and, in 1908, went to Paris where he attended the Académie Julian. 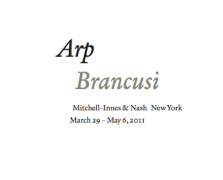 Arp has had numerous solo exhibitions including at the Georg Kolbe Museum, Berlin, Germany (2015); Max Ernst Museum, Bruhl, Germany (2014); and at the Museum of Modern Art, New York (2013). His work is also part of many public collections such as, the Tate Museum, London; The Art Institute of Chicago, Chicago, IL; and the Museum of Modern Art, New York.